Steel sheet pile retaining wall is currently used in infrastructure projects is very frequent, small to the construction of fire piles of steel piles support, municipal pipeline pipeline excavation steel sheet pile retaining support, to achieve high-iron pile platform construction of steel sheet pile support, dam construction steel sheet pile Retaining walls and so on. Then the steel sheet retaining wall design requirements which? I believe that not every designer can find out, the following we and the blue road plate pile of engineers together to see it! Second, the steel sheet retaining wall normal use conditions. These two types of conditions, respectively, on behalf of the steel sheet retaining wall bearing capacity limit state and the normal use of the limit state. The ultimate stability of the retaining wall structure of the steel sheet pile retaining wall should take into account the overall stability of the retaining wall structure of the steel sheet pile, including the mechanical properties of the soil, the structural failure, the excessive deformation of the wall and the influence of the soil change on the adjacent structure. The failure mode of the steel sheet retaining wall includes movement or rotation. The stability of the retaining wall of the steel sheet pile depends on the degree of earth pressure, and the earth pressure can only be fully mobilized when the structure is quick, and then the bearing capacity limit state. Steel plate retaining wall normal use limit state design to consider the steel sheet pile wall deformation and soil movement, must ensure that both will not exceed the allowable range. Compared with the deformation of the soil under the normal use limit state, the deformation of the soil is much larger when the earth pressure is fully mobilized. As the force acting on the retaining wall of the steel sheet pile and the force in the soil are inversely proportional to the deformation of the wall, the deformation in the normal use limit state is the control standard of the wall balance. 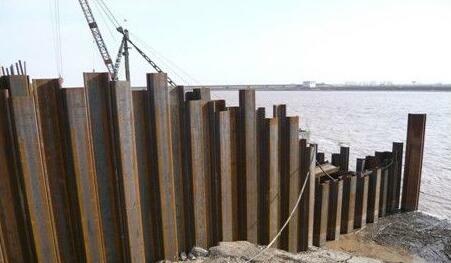 Although the steel sheet pile wall can not directly calculate the deformation of the wall, but can control the degree of pressure to adjust the degree of normal use to limit the state. In practice, a safety factor is usually introduced. The lack of experience of the designers often ignore the steel sheet retaining wall design of the preparatory work, that is, the need to use what type of steel sheet pile, piling more difficult places are usually high-strength steel sheet pile, so that less one or more support, Thereby reducing the workload. The designer must be fully aware of the situation and the resulting impact of the steel sheet retaining wall in use. In the corner of the retaining wall of the steel sheet pile, the special shape piles designed according to the corner shape are specially designed. Due to the special shape of the cross-section, the quality of the processing is not easy to be ensured, especially for the closure of the special-shaped piles are often before the closure in accordance with the specific circumstances Processing, making the construction progress affected, and then the shape of the pile into and out is also more difficult. So in addition to special circumstances, should be avoided. Before the construction of the steel sheet retaining wall or at the end of the construction, a certain number of special connections shall be prepared. The cross-sectional shape of the link shall be "W" shaped according to the length of the steel piles retaining wall and the length of the link and the steel sheet The number of steel sheet piles and the number of link pieces, so as to adjust the number and direction of steel sheet piles, steel piles and link pieces together to form the sheet pile wall, according to the adjustment of the wall to achieve the corner or close. That is the method of adjusting the position and length of the axial wall of the retaining wall of the steel sheet pile is realized.